If you type “Nicola Sturgeon” into Twitter search today the words “Prime Minister” will predict automatically. This morning her name was the most googled term in the whole of the U.K., which shows just what an impression she made at last night’s televised leaders’ debate, despite the fact that earlier this week a panel of British voters couldn’t identify her from a photograph. Twitter stats show the Scottish National Party (SNP) leader was mentioned more than 113,000 times on the site during the live debate, with the vast majority of tweets being extremely positive. Sturgeon appeared alongside six other party leaders last night: Tory leader and current Prime Minister David Cameron, Labour leader Ed Miliband, Liberal Democrats’ Nick Clegg, UKIP’s Nigel Farage, the Greens’ Natalie Bennett and Plaid Cymru’s Leanne Wood. 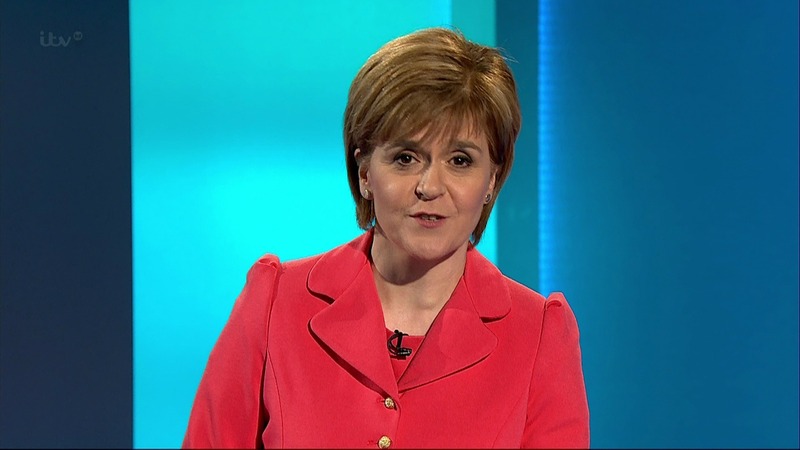 While the results of viewers’ polls following the debate vary a YouGov poll crowned Sturgeon as the clear winner, with 28 percent of the vote, and a ComRes poll for ITV made it a four-way tie between Sturgeon, Cameron, Miliband and Farage. In fact if we could depend on the reaction polls as a good indication of voter intention — which we can’t — the SNP party would expect 20 percent of the national vote, only a single point behind UKIP and two points behind joint leaders Labour and the Conservatives. This is pretty incredible considering it’s impossible for anyone living outside Scotland to vote for the SNP and Scottish First Minister Sturgeon cannot become Prime Minister, as the system currently stands, because an SNP presence in the House of Commons will simply never equal that feasible by UK-wide parties. And in any case, if the situation were to change, it’s highly unlikely the leader of a party campaigning for Scottish independence would want to be the political leader of the U.K. as a whole. As expected it was a lively debate with many standout moments. Here are a few reasons Sturgeon may be performing so well in the polls today. Sturgeon vowed to “fight, work, vote, do whatever it takes” for free university education in what was one of the most inspiring moments of the entire debate. Highlighting the “intolerance of Nigel Farage,” Sturgeon brought the immigration debate back to reality with some indisputable facts, while advocating a more positive, welcoming approach to migrants. It’s no news that UKIP leader Nigel Farage can turn any subject, from the NHS and house prices to the U.K. economy, into an argument about immigration. Sturgeon didn’t hesitate in challenging him; in fact all three female leaders stood up to Farage in a way Cameron, Clegg and Miliband failed to do. While the SNP continues to campaign for Scottish independence, Sturgeon assured voters throughout the U.K. that, as long as Scotland remained a part of the Westminster system, her party would fight for the reform needed to make Westminster more responsive to what the ordinary person needs and wants. Why do some parents think it’s OK to bully teachers on social media? What should Britain’s national bird be?